DCC++ is a Command Station based on the Arduino UNO/MEGA and a L298 Motor Shield. The DCC refresh stack size is 12, on a MEGA up to 50, with 127 speed steps and 28 functions. 32 GCA Interfaces compatible I/O. Start of Day directly after establishing a serial connection. The DCC++ library in Rocrail is dccpp. The baud rate is fixed at 115200. The only thing to setup is to choose the right virtual serial port. A TCP/IP connection can be used if the Arduino features an Ethernet Shield. The TCP/IP Port is fixed at 2560. Serial read timeout in ms. The number of slots is default 12. If using the MEGA it can be increased in the DCC++ sources. 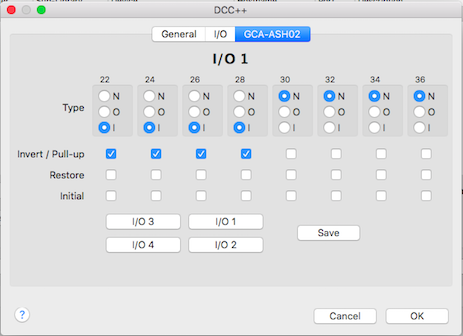 The number of slots must be less or equal to the number of registers set in the DCC++ sources. You can increase the number of registers to greater than 12, especially if running on he Mega, not sure what the max would be, but I'm guessing about 50. The minimal idle time in seconds before a slot ist purged. For pin 22..53 on the MEGA only. The delay timer will be reset if an input gets high within this time. Echo switch commands for Arduino I/O only. Swap the turnout and straight commands. Reduce the generated switch and output IDs to 16. (0…15) Default is 256. This option allows usage of an Arduino Uno with more than 45 devices addressed on DCC. Add a new I/O as defined with Type/Pin/Options. It will be temporary created in the DCC++ CS. Modify the selected I/O with the Type/Pin/Options settings. It will be temporary modified in the DCC++ CS. It will be temporary deleted in the DCC++ CS. 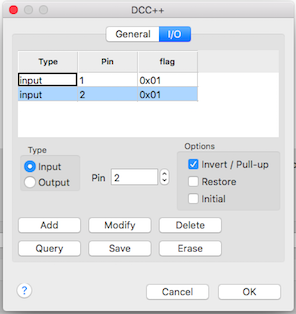 Query all defined I/O's in the DCC++ CS. Save all defined I/O in EEPROM. Erase all defined I/O from EEPROM. A new query is automatically issued. Sensors and Outputs are sharing the same address space; Avoid overlapping to prevent unexpected behaviour. Free Arduino pins can be used as sensor ports. Outputs are addressed by the NMRA scheme with decoder address and port. Free Arduino pins can be used as output ports. 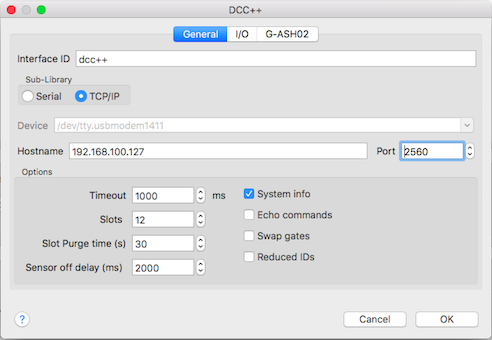 To map the output for DCC the option "As switch" must be activated. The accessory flag is used for Output commands. Aspect number and Aspect Value can be used. The aspect value represents a bit masks used for the four signal addresses. I/O interface for the Arduino MEGA. The GCA I/O connector selection. The button layout resembles the PCB layout. JP1 Use 5V from Arduino board if placed. Place only if the Arduino is powerless, otherwise it will reset itself. The rail power must be set to on before using the Programming Track. Do not forget to add the required jumper wire on the Motor Shield. Set the number of Decoder steps to 126 instead of 128 on the Interface tab of the loco properties. These values apply to the Arduino Motor Shield R3 with a Current sensing of 1.65 V / A. The Current sensing of other Motor shield types may vary, especially if its max. current is > 2 A. Important Note: There are Motor shields with Driver chips LM298 which are so mounted that the heat can't pass over to the Board surface. The picture shows that in this assembly, it may possible to push a Paper strip under the chip. At full load (2 A) for a unit with this lack can't the heat dissipate and the chip get inevitably to hot and will be destroyed.